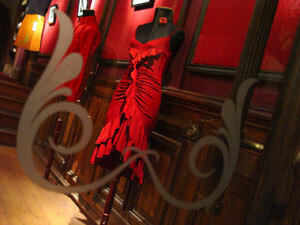 It is an ironic feeling to walk into Tango Brujo. Despite the modern content, you feel like you are entering an old world where secrets and sensuality meet to form the dance that smolders in intimacy. The dark wood and warm colors along with the winding staircase leading upstairs to the burgundy draped studio make you feel like you have entered an elite kingdom belonging only to the initiated. But democracy rules here, with a friendly, reassuring atmosphere that embraces everyone. At Tango Brujo there is no attitude. Only the willingness to impart knowledge and to share in the exuberance of Tango’s expanding vocabulary. 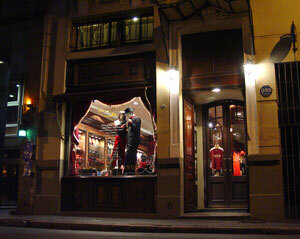 The ground floor houses Tango Brujo’s store. Here you will find classic and modern Tango CDs, assorted knickknacks that make for great presents, and a line of original clothing and shoes, designed for the contemporary dancer who wants to feel comfortable, fashionable, and appropriate when practicing or performing. A few steps up and you are in the dressing room area, complete with a plush red velvet couch for trying on shoes or for waiting while your partner completes her or his wardrobe. Upstairs is where all the secrets are revealed. With a staff of young teachers, the sensation is that you are in a laboratory where barriers are broken in favor of new creation. Under the direction of Gaston Torelli, guest artists are in constant rotation along with staff luminaries Kara Wenham and Matias Faccio, Mariela Sametbandt, Anita Monteagudo and Pablo Retamar, Santiago Dorkas and Cecelia Garcia, among others. Each teacher is a performer in her or his own right, which helps to create an atmosphere of electricity and panache. Classes include improvisation and musicality, exploration of movement for the stage, physical preparation, women’s technique, and more. There are also guided practices during the week where students can work on what they learn. 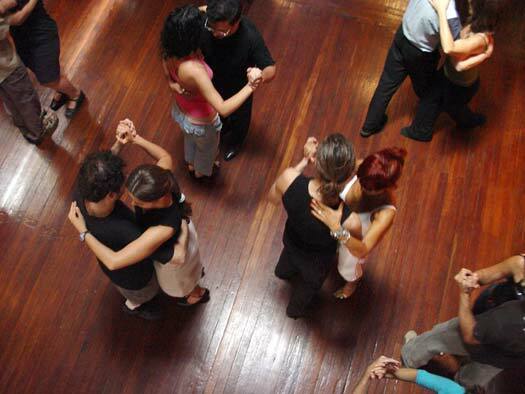 With so much under one roof, Tango Brujo has become a treasure where dancers can learn technique from the ground up, perfect and hone an individual style, and enjoy the company of students and professionals in a Tango atmosphere where creativity rules. 1. How much is each provate lesson? 2. Is the lesson in English? 3. Which hotel nearest to your school do you recommend? 4. What would I learn in each lesson? PS. I am a male student and I have done a year of Tango dancing. Thanks for any information. por que no mestran zapatoa de tango!!!!!!!!!!!!!!!!!!!!!!!!!!!!!!! This page rendered in 0.343 seconds.